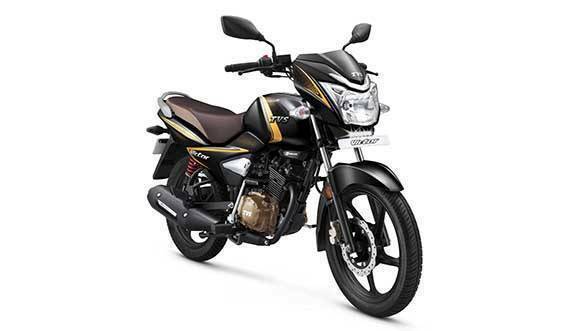 TVS Victor has been updated with a SBT (Synchronized Braking Technology) which is essentially a combined braking system and the prices for the SBT variant starts from Rs 56,682 and go up to Rs 57,662 ex-showroom Delhi. TVS claims that new technology reduces the braking distance by ten per cent. There are no other changes in the motorcycle apart from the updated braking system. The TVS victor is powered by the same 110c single cylinder air-cooled engine that produces 9.5 PS of power at 7500 RPM with a torque of 9.4 Nm at 6000 RPM. The engine is mated to a four-speed gearbox. The styling is carried forward as well and mechanically the bike gets the same telescopic suspension units in the front and a dual shock absorber unit at the rear. The Victor is offered in a choice of four colour schemes - Black Gold, Red Gold, Matte Blue and Matte Silver. The TVS Victor rivals against the Hero Passion Xpro and the Honda Livo.